I had only one day to unpack from my mother's funeral and repack for my planned trip to Maine to paint. Along with my clothes and art supplies, I took a heavy heart to a beautiful cove in Cushing, Maine. Solitude is good for both grieving and for making art. After getting settled and getting acquainted with the area and places I wanted to paint, I started painting. 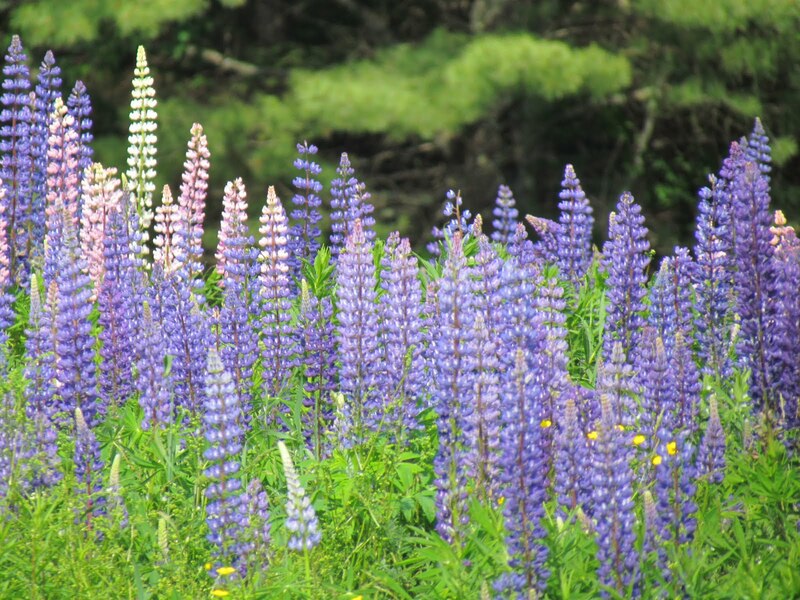 I did two paintings of the cottage I was staying in, several watercolors from the dock, and one of the gorgeous lupines. It was the perfect time to catch them at their peak! After painting away from the cottage, I decided to paint off of the back deck. But first, I enjoyed the view for a while, sitting in the pink adirondack chair in the back yard. It matched the shutters of the house. As I rested and, I thought of how much Mom would have loved that chair. It was her color, an intense knock-your-socks-off pink. 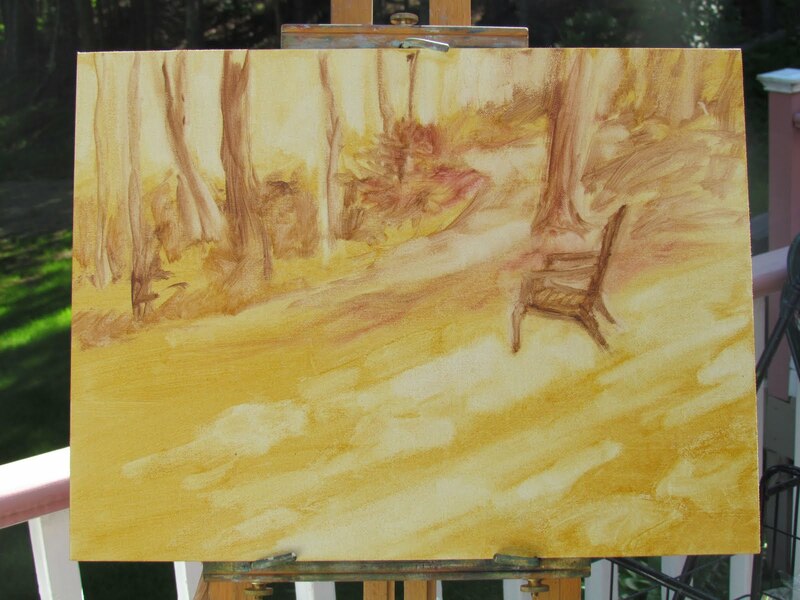 Back on the deck, I started painting and decided that the chair looked so good there, I would paint it in. I was not prepared for what happened. I took a lot of care with this painting, painting an underpainting first, to check the composition and value areas. I was taken at how the chair sat on the line between light and dark in the yard. 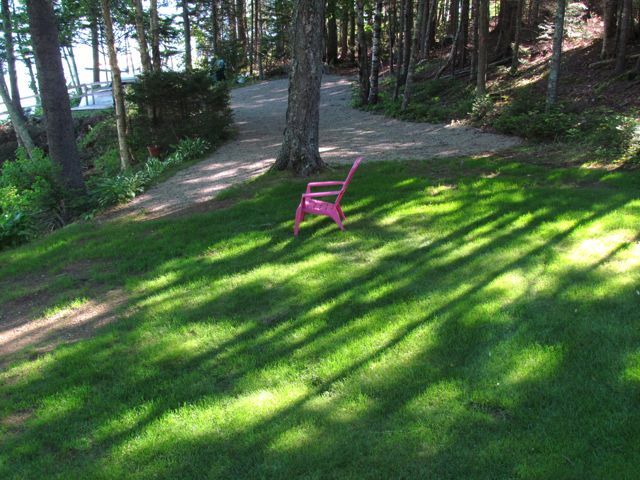 As I carefully started to paint the pink chair into the work, all of a sudden I sensed the presence of my mother. She was there! in the chair! And she has stayed with me through this adventure in painting. I'll show you the final painting on the next post. The camera and photo is in the studio and there is a hurricane between us! Welcome to my Pink Chair Paintings Blog!